We’ve been getting alfalfa-related questions from readers. Genevieve Slocum and David Hunsberger of King’s Agriseeds have some answers. My cows and calves have been on a pasture for about a week with approx. 50% grass 50% alfalfa it has dried down on the stem and we have had -2 c frosts several times some of the stand is still green but the majority is dried on the stem. Would the dried alfalfa still have nutritional value for my cows and calves? They are April May calves. Any info would be appreciated I am new to grazing hay fields but due to the shortage of hay this year I would like to pasture as long as possible. It sounds like a succession of these light frosts has taken its toll. The stand still has nutritive value, but the value of any killed tissue will continually decline. Legume quality declines faster than the grass quality, because the legume will drop its leaves as it stands and dries. Protein, TDN, and digestible fiber decrease over time, as the plants leach nutrients and soluble carbohydrates and continue respiration. However, the initial result of a freeze, before the plant dies and begins to dry, is to become richer and more nutritious. As intercellular water freezes, cells are squeezed and ruptured, increasing levels of soluble protein and NSC. NSC has been accumulating throughout the cool conditions of fall in preparation for winter, and becomes more available with the sudden rupturing of cell walls. This can be a problem for horses, as limiting sugar intake is often a prime consideration in their diets. There’s also a challenge with this spike in soluble protein and the increased wetness of a plant that has just weathered a frost. If you graze within about a week of the frosts, there is an increased bloat risk. This risk applies as long as there is green, succulent tissue remaining, so the plant needs about a week for this damaged tissue to either dry down or regenerate from the crown. This time consideration does have to be balanced against the damage done by weathering and leaf loss as the plant stands. Maturity plays a role as well – bloat risk is highest in pre bud stage, and decreases as blooming progresses. 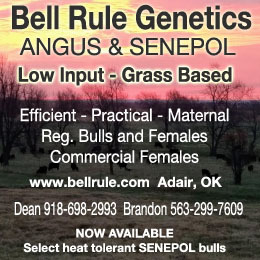 Since you have a mixed grass-alfalfa stand, the risk will already be much less. For stand longevity considerations, it was wise that you allowed the frost to send the plant into dormancy before grazing. Bottom line, there is still nutritional value in the standing hay. To get the most out of the feed, consider strip grazing it with some poly wire. Set up a few, as the calves will no doubt duck under and do some leader grazing. You did not specify which variety of grass you are using, but tall fescue is the best grass for stockpile grazing. Make sure to keep the cattle moving across the field to limit pugging damage, and leave a 4 inch stubble of grass as an energy reserve for spring growth. Early next spring, you may want to use some nitrogen and sulfur to give it a good start at green up. The main thing to be aware of is that there is no such thing as zero bloat risk, and legumes like alfalfa aren’t the only risk. It’s best not to approach any legume, or any fresh forage, for that matter, as “non-bloating.” Instead, use the precautionary principle and manage for reduced bloat risk. The known factors in legumes that can contribute to bloat are soluble proteins, saponins, absence of condensed tannins, and rapid breakdown of plant cells in the rumen. Of these, this last factor is the one addressed by AC Grazeland. It was bred to have thicker cell walls, longer stems and internodes, and higher NDF and ADF. This increased fiber content in the plant reduces the risk – decreasing the frequency and severity of acute bloat – but does not eliminate it. The alternative non-bloating legumes, on the other hand, such as birdsfoot trefoil and sainfoin, lower risk by means of condensed tannin content. These mitigate bloat by binding to proteins that are rapidly released in the rumen during fermentation. Bloat usually begins when large amounts of digestible protein enter the rumen, resulting in a rapidly-forming microbial bloom. These microbes release a large quantity of gas and slime, and the cow is unable to burp out the frothy bubbles that form. Keep in mind that even non-legumes can pose a risk of bloat – any lush pasture, especially when it’s a dramatic change in the diet or the animal is turned out hungry – is a risk. At King’s AgriSeeds we do not carry this variety or any similar varieties, so I can’t personally speak for its performance. Instead, we advocate mixed stands of grasses and legumes – at a maximum of 50 percent alfalfa, bloat risk in a mix is significantly reduced. And we even tend to go in the opposite direction with some varieties, sourcing conventional low-lignin genetics, with the belief that fiber digestibility in a mixed stand will help optimize nutritional value to the animal. When grazing this variety, I suggest you maintain many of the same precautions you use with many other legumes – don’t treat it as no-risk. For example, don’t turn out hungry animals on the alfalfa; it’s best to feed dry hay first. Avoid grazing it when wet – with dew or just after a frost, which initially increases plant moisture and availability of cell contents. The first few days after a frost are when the bloat danger is highest, and it drops off after this as the plant dries. Also, if you can graze at a later maturity, at least 15-20 percent bloom, this will increase lignin content and slow digestion and any bloat risk drops substantially. Offering poloxalene for three days prior to grazing is a great preventative tool. Remember, fiber is your friend. Focus on supplementing hay and mature/dry pasture. And avoid grazing the alfalfa when it’s wet or dewy. Alfalfa autotoxicity is only an issue when planting alfalfa into alfalfa. In the short term, you can thicken up stands with cereal grains in the fall. Grasses like orchardgrass and fescues are not fast starters and are easier to interseed in late summer. The seedlings should have 45 days minimum to get going and reach 5 to 6 inches before a killing frost. 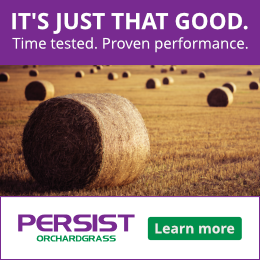 If you try a no-till interseeding in spring, use a fast starting grass like festulolium. Another option is to introduce red or ladino clovers by frost seeding in late winter, or with a no-till drill in late summer. Make sure to reduce the competition from the existing stand before interseeding. You can use a mob grazing at a high stocking rate to graze the stand down and shock it back, or a close mowing. 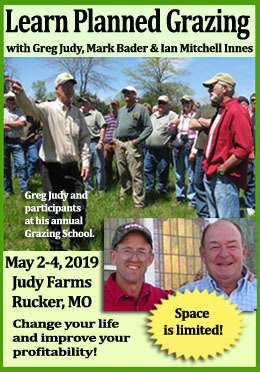 Late summer will be the most advantageous time for the new seedlings, with the cooler, moist weather of fall setting in and the declining weed competition. You will also want to make sure that you have the weight and down pressure needed to cut through any residue and root material to get the seed placed at the proper depth and with the seed-to-soil contact it needs to absorb moisture and germinate. One last thing to consider: is reseeding the best solution? If the stand is thin as a result of poor soil fertility, management shortfalls, or overgrazing, then the problem will not correct itself just because you add more seed. You may benefit far more from fertilizing according to soil tests or clipping more frequently following grazing. Remember, how you manage the pasture – in terms of grazing management, stocking density, and soil fertility – will actually turn out to be just as important as the seed you put down in determining the type of stand you end up with and the species expression. Rotational grazing that includes more intensive grazing gradually improves species composition. If an extreme weather event thinned the stand, that makes an even better field for reseeding. Additionally, most pasture mixes are only productive for up to five years before other species start taking over, so renovation is needed periodically to manage a high-producing pasture. Have you got questions? Let us know and we’ll do our best to get them answered! What Farming Challenges Did the Pilgrims Face? Have You Checked Out the Conservation Stewardship Program? Hi Curt – elk are browsers and they feed on a variety of plants. They are ruminants and their rumens digest the fiber into usable volatile fatty acids and microbial proteins. The fiber is still there, just the soluble carbohydrates are leaching out through weathering. There are eleven elk feeding in a 15 acre field of alfalfa regrowth (it was at late bloom when our winter began) and it has had snow on it for a month. They have been there for about three weeks and appear to be eating alfalfa. This particular field had an orchard-grass winter-kill last winter so there is little grass remaining under the snow. How do the elk survive? I know: this question is not really on the topic but. . .